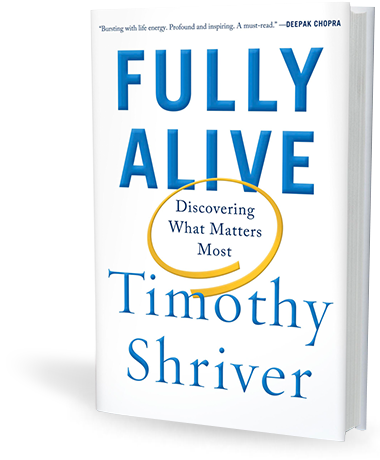 Tim Shriver provides exclusive excerpts from his book, Fully Alive. Just as we raced around the backyard and campaigned around the country and journeyed around the world, we were always doing so with an eye on the need to serve those who had neither wealth nor power nor influence. Somehow, this never seemed inconsistent to me…We would travel abroad and meet a prime minister or a king and then, on the same day, visit an institution for people with intellectual disabilities or a Peace Corps project focused on sewage. My parents would hold parties for cabinet secretaries or movie stars, and the next day load up our station wagon to deliver canned goods and turkeys to a soup kitchen. The wealth my grandfather created was also a focus of the lessons we learned as children. Among the many gifts my parents gave to me and my siblings was their determination that the comfort and privilege of our childhood would not make us feel self-satisfied or entitled. My father reminded us relentlessly that the children of the rich ‘usually amount to a hill of crap,’ warning that such a fate was not an option for us. Both of my parents were vigilant in rooting out any traces of arrogance….By a strange and muddled calculus, we learned of our privilege mostly in the context of denying it and, even more important, of repaying it.